This delightful cabin is perfect for your next mountain getaway. Walking distance to Royal Gorge, North America’s largest cross country ski resort, and minutes from Sugar Bowl, it’s perfectly situated. Some of the cross country trails are right out back! The cabin is located in the beautiful Serene Lakes community, near two gorgeous lakes so it’s ideal for all seasons. This 4-bedroom, 3-bathroom cabin has all you desire for your next vacation. The large windows found in the lounge area bring the outdoors in, allowing you to experience the gorgeous landscape surrounding the cabin. With a two car garage and enough beds to sleep thirteen people, Pahatsi Clubhouse is perfect for large groups. The open plan living/dining area and spacious deck with a BBQ is ideal for entertaining and relaxing. Sit around the fire, soak in the hot tub, or relax in the game room, this clubhouse has everything you could possible want for your next vacation. We have stayed here twice now and have a third weekend booked. We love this house! It is roomy, clean, well appointed and sleeps 3 families. The kitchen/great room has a beautiful view with large windows and a deck. The kids love hanging out in the hot tub after skiing. We really appreciate how clean and spacious this house is and the beds are all comfortable! See you again in a month! 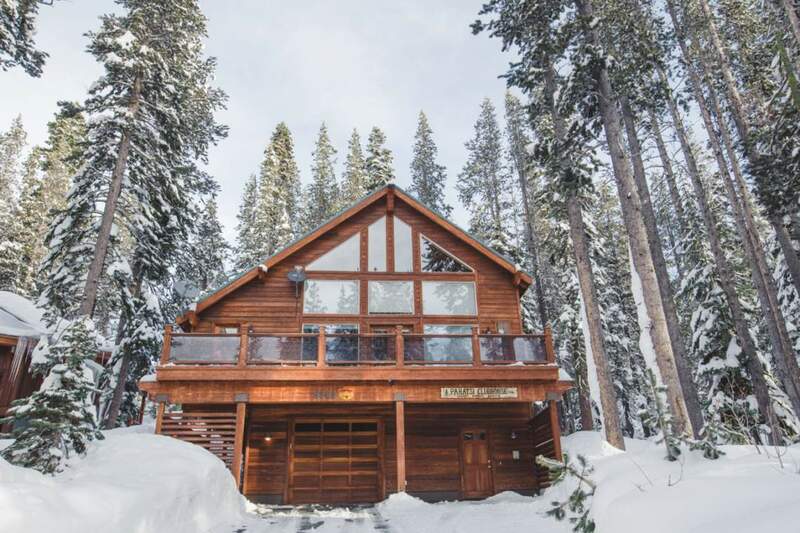 This is a beautiful cabin and very convenient for my snowboarding family. The beds are very comfortable and the layout of the cabin works very well for my family of 10. We will definitely stay at the Pahatsi Clubhouse again, and working with the Donner Summit Rental Co. was great. Pahatsi Clubhouse is a great rental house. The central room is cozy with lots of seating and it's well arranged for people to chat or watch T.V. There's plenty of sleeping room and bathrooms for 10. The shuffleboard was fun and the hot tub was great after a day of skiing. The kitchen made it easy to cook for a crowd. Would definitely rent this house again. We stayed in the Pahatsi Clubhouse and it was awesome! The location was perfect for our staff. The house was beautiful and clean and perfect for our needs. It had a hot tub which we never used but we will next time! Abby and Leanne were there for us if we ever needed anything. We will definitely be renting from them again next year. We loved the Pahatsi Clubhouse. It was a great lodging experience for our group and we would stay there again. Clean, comfortable, modern and well equipped. A great stay! Our group also stayed at the Ice Lake Sisters house during the same time - see separate review. We really enjoyed our stay at the Pahatsi Clubhouse. It is a beautiful home and very cozy! We had a group of ten & found the house to be very spacious. Beds are very comfortable too. One issue we had was that the bathroom doors and a couple bedroom doors would not lock. The handles didn't line up properly with the frame so the doors didn't close properly. But, we just taped an "in use" sign on doors. Regardless, this is a great house! We loved the game room & jacuzzi! Kitchen is great & fully stocked. This was our second trip to this house and we will definitely be going back!